In the following article, we distinguish between an internal RTC (on the Colibri/Apalis module) and an external RTC (on the carrier board). Toradex recommends the use of an external RTC because it often consumes more than 10 times less current than an internal RTC allowing a much smaller backup battery to be used. On the other hand, use of an internal RTC may simplify the carrier board design and may allow wake up using the alarm capabilities. For information regarding RTC use in Linux, see How to use the Real Time Clock in Linux. For information regarding RTC use in Win CE, see RTCSync. All Colibri & Apalis modules provide an internal RTC. Most modules (except some PXA models) provide an internal RTC which can be powered by a battery when other power is absent. Some modules also support charging of the battery when other power is applied. Use of a battery is optional. When a battery is not utilized, the RTC is simply cleared when power is removed. Some modules possess two RTCs - one in the SoC and one in the PMIC. In this case, the PMIC RTC is what is powered by the external battery when no other power is applied. Note: On WinCE T20/T30 use the settings described here to use the on-module RTC. The Apalis TK1 features an RTC in the PMIC. The internal RTC on modules that have i.MX6, i.MX6 ULL and i.MX7 processors is provided by the SoC. Vybrid-based modules have an internal RTC that can be powered through VBATT and will not be influenced by changes of state of the main processor. It is possible to use an external RTC and the RTCSync tool (already included in the standard Windows CE images) to synchronize it with the internal RTC at each boot. 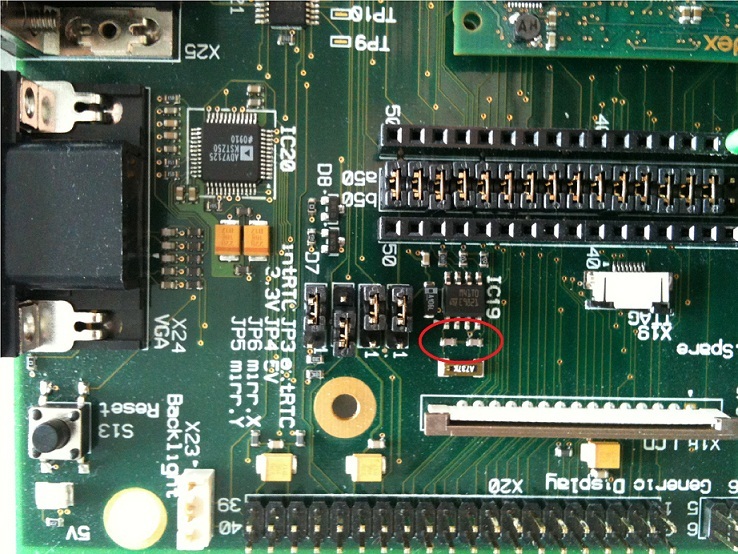 The PXA processors have an internal RTC. But unfortunately the internal RTC loses its settings when the reset signal is asserted. In case of a SW reset (Cold or Warm boot from the WinCE Update Tool) or go to sleep and wake up, the RTC will keep the correct time and date. All other Colibri PXA modules lose the RTC time during any power cycle. The current consumption of these RTCs is typically 30-50µA. Because of the "reset feature" of the internal RTC, we have added an external RTC (M41T0 by ST Microelectronics) on all our Baseboards. This is also recommend in many cases for customer base boards. The external RTC has the additional advantage of a very low operational current of about 1.7µA. To increase the accuracy of the external RTC on the Evaluation board V2.1, you can remove the two capacitors C100 and C101 on the Evaluation Board V2.1 (see Evaluation board V2.1 schematics). The following picture shows the location of the two capacitors which could be removed. The RTC circuit components are not assembled by default. Please refer to the Real Time Clock (RTC) section of the Viola datasheet for detailed information. The Viola Plus V1.2 comes with the RTC circuit components assembled. RTC drift measurements were made from each device's respective Linux image and are presented as absolute values.